I mentioned earlier about my own bonsai soil mix. This isn’t as scientific as it first sounds. As many of you may already know bonsai enthusiasts throughout the world have been turning to cat litter (kissanhiekka) as an inorganic soil alternative to Akadama. Akadama is expensive and can be difficult to obtain here in Finland, often only available by mail order from another country. Cat litter is of course much cheaper and can be purchased from any supermarket. 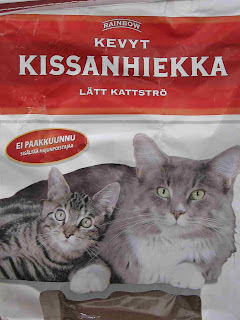 I have tested a couple of brands to establish if it retains its shape when wet and frozen and found that the brand ‘Rainbow Kevyt Kissanhiekka’ is the best cat litter that I have come across at the moment. I have used this cat litter for over a year for all my bonsai, indoor and outdoor, without any problems. The soil mix can be 100% cat litter if you require, but you can also mix it with other ingredients for specific tree types or to suit your own personal preferences. For example you can add some grit for a drier mix used on pines, junipers etc. or some pine bark to retain more water. When using any material for bonsai soils it is important to remove the small particles and this is also the case with the cat litter. I have found with the brand that I am using that the largest particles are ok and remain in my mix but I sieve out the smaller particles less than 2mm. These small particles are not needed in the mix, as they will not allow the water to run through as easy. My own bonsai soil mix has been made up of roughly 50% cat litter and 50% pine bark. The pine bark is also purchased from any local garden centre and then I run this through an old food processor to cut into smaller pieces. Again, as with the cat litter, I sieve out the smaller pieces and this time also remove the larger pieces that are bigger than 5-6mm. This bonsai soil mix I have used especially on my indoor bonsai because it helps to extend the time between watering that can be problem if using 100% cat litter. Two of the most important tasks that need to be performed correctly for your bonsai to grow, watering and feeding, have been made easier by using cat litter. Watering of my bonsai was a job that was a little difficult to understand in the beginning with questions like How often should I water? and What different watering schedules are needed for different trees? All this is now history when using cat litter. If required I could water my bonsai everyday, this can easy be the case in the summer, without any problems because any excess water not retained by the cat litter simply runs out the holes in the bottom of the pot or container. The use of cat litter has also changed how I feed my bonsai. As with the watering I was constantly reading about different feeding systems for different types of trees, but now I feed during the growing season every 10-14 days with a balanced feed knowing that the daily watering regime during this period will wash away any excess fertilizer before the next dose. Cat litter is a cheap, easily obtainable alternative bonsai soil that will help to keep your bonsai growing vigorously with regular watering and feeding regimes.